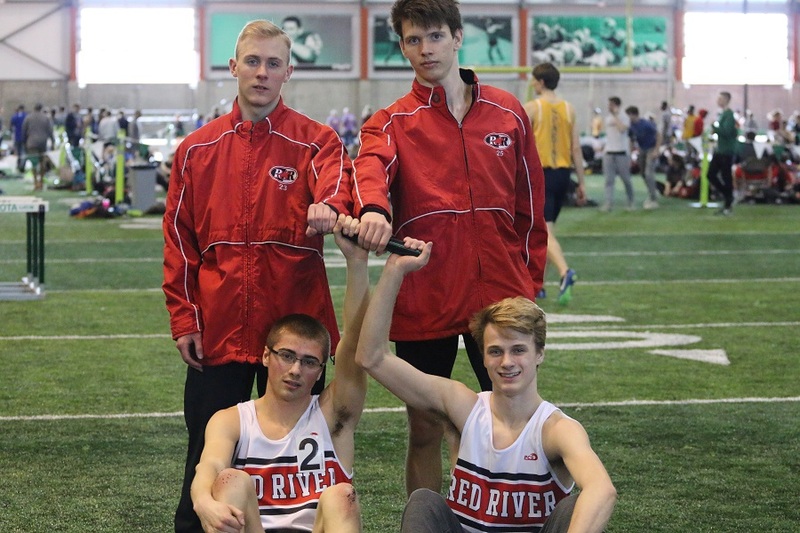 For the first time Thursday, Red River competed at UND’s High Performance Center (HPC). The Sertoma Club Invitational, typically an outdoor meet, was moved inside and played host to twelve teams for a unique indoor meet that featured a full 100m Dash, 110m Hurdles, and 300m Hurdles. The facility’s 300m track also lended itself to a 4×300 and 4×600 Relay, as well as the running of the 1500m and 3000m. As most indoor track facilities have 200m tracks, these events are not usually contested indoors. Leading the way for the Riders was senior Tyler Burian and sophomore Bryce Enerson. Burian scored 16.5 points and placed individually in the 200 (2nd-22.87-PR) and 100 (3rd-11.45-ties PR). In the 4×300, Burian teamed with Pierson Painter, Stoker Short, and Thomas O’Halloran to place first with a time of 2:28.18. Seeing how this is the first time in school history the event has been run, the result will stand as the school record. Enerson started his day by running a lifetime best of 43.66 in the 300m hurdles and finishing in second place. In the 110m Hurdles, he also placed second (16.35). Placing 6th in the 300 hurdles (45.34) was Dilson Gurung, the 8th grade upstart who continues to impress at the varsity level. A solid day’s work was put in by O’Halloran, who anchored the winning 4×300 team, the 3rd place 4×600 team, as well as placed 4th in the 400 (53.38). Byrne, Cole Stenseth, and Short also ran on the 4×600, which set the bar for all future Rider relay teams at 6:03.36. In the 3000m, Byrne (9:32.03), Stenseth (9:34.21), and Jake Arason (9:49.50) completed a 3-4-5 finish with some excellent tactical running. Sophomore Kaden Rohloff continued to vault well, matching his season best of 12’6 in a runner-up effort. Also placing for the Riders was Marcelles Sartwell (4th-800-2:09.88-season best), Painter (high jump-5th-5’10), Tim Dunham (7th-1500-4:27.89), and Brett Klefstad (shot put-7th-45’7). In the team race, the Red River Boys placed 4th out of 12 teams with 90 points. West Fargo won the meet (115.5), while Fargo South (100.5) and Fargo North (100) placed 2-3. A big thanks to the Grand Forks Sertoma Club for supplying t-shirts to event winners! On Saturday evening, RR and GFC met for the Dual, an annual early season meet pitting each school in head to head competition. In this meet, depth is key, as the meet is scored through twelve places instead of the usual eight. For the 10th straight season, the RR boys defeated the GFC boys in the Dual (871-321). A big highlight of the meet for the coaching staff was the successful running of the 4×300 Relay. The Riders entered 13 teams (52 athletes) in the race. This many athletes competing at once exemplified what makes track and field such a great sport. Stepping out on the track and competing for yourself and your team is not easy and it’s something many high school athletes shy away from. It’s easy to recognize event winners, but it’s also important to remember in this sport that a lot of people competed as hard as they could and improved as an athlete and a person. Keep working hard and you will be rewarded with PR’s. Your efforts are appreciated and noticed. The team anxiously awaits warmer weather this week, the pasta feed on Thursday night, and the Davies Eagle Relays on Friday. The meet at Davies is a highlight for many during the season, as the whole meet is scored relay style and features races not usually contested. Red River is the only school to have won this meet in its four-year existence.